WALK 97.5 FM and King Kullen supermarkets will once again partner to host WALK Radio's annual "Thanks for Giving" Food Drive in support of Long Island Cares, Inc.
Long Island, NY - November 4, 2014 - WALK 97.5 FM and King Kullen supermarkets will once again partner to host WALK Radio's annual "Thanks for Giving" Food Drive in support of Long Island Cares, Inc. - The Harry Chapin Food Bank . This year's food drive will take place November 12-20 at 9 King Kullen locations, throughout Nassau and Suffolk counties, and culminate with WALK Radio on-air personalities broadcasting lIve on Thursday, November 20 from 5:00 AM - 7:00 PM at the King Kullen in Commack. 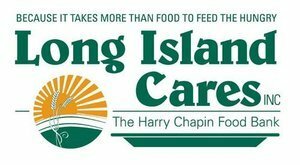 Long Island Cares' staff and volunteers will be at each location collecting donations of non-perishable food, household supplies, personal care products, pet food and more for distribution to the food bank's network of 588 community-based member agencies in time for the Thanksgiving holiday. In addition, Long Island Cares will be distributing information about its broad array of direct service programs that support children, veterans, seniors, pets and families in need. Live Broadcast with Mark & Cindy from the WALK Breakfast Club, Patrick Shea, Parker & guests! For more information and to volunteer call (631) 582-FOOD or visit our website. Pet Peeves "Dog Days of Summer" Event to Collect Pet Food Donations for Long Island Cares, Inc.
Subject: LongIsland.com - Your Name sent you Article details of "2014 "Thanks For Giving" Food Drive To Support Long Island Cares, Inc"